Vanguard Import of downloaded CSV file. Go to the Vanguard web site and log in to your account. Click on My Accounts & Transaction History. 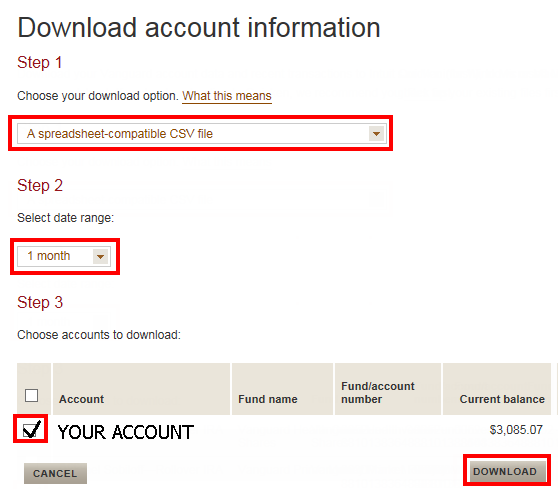 Choose A spreadsheet-compatible CSV file from the Step 1 download option drop down box. Select a date range for your report such as 1 month or 1 year. Put a check mark for the one account you wish to download from and click the Download button. Save the CSV file to your "documents\tradelog\import" directory. Please do NOT open the csv file with Excel. Opening the csv file and then saving it will change the original formatting and render in unreadable by our TradeLog Vanguard import filter. Click on the Vanguard Imp speed button. If there are no trades in your TradeLog data file an "IMPORTING RECORDS FOR THE FIRST TIME" dialog box will pop up - click YES. An Import from Vanguard *.csv file dialog box will appear - click on the YES button. Select the appropriate CSV file and click on the Open button.